There’s more to Melbourne’s dress circle than you might think! Cobaw Ridge Winery, Macedon Ranges. If getting to the source of wine production is for you, Melbourne is your city! Victoria’s coastal capital is the southern most city on the mainland of this dessert continent and boasts numerous wine regions within a short drive from the city. One such region is the Macedon Ranges. Where, I hear you say? Located northwest of Melbourne and less than an hour’s drive from the city, the Macedon Ranges region offers a diverse range of wines and a warm cellar door welcome. Stretching 65 km wide and 40 km in length, the Macedon Ranges GI (Geographical Indication) is a large area, roughly rectangular in shape and split by one of Australia’s defining geographical features, the Great Dividing Range. Within the Macedon Ranges GI are several mountains, including the dormant volcano Mt. Macedon and it is this diversity of geology that allows for the production of a plethora of different styles of wine. 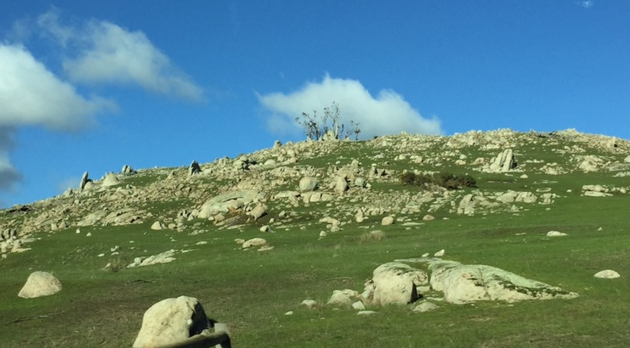 As you approach the region it is possible to see outcrops of granite rocks littered around the countryside. The industry, in the same way, is scattered in pockets across the GI as winemakers seek to harness the granite, volcanic and clay soils found here. Additionally this region has altitude. Vines are planted anywhere from 280m – 800m above sea level and this too contributes to the fragmented location of cellar doors; to outwit Jack Frost and the high winds that can whistle through here, winemakers must find those sites that offer protection where every possible. 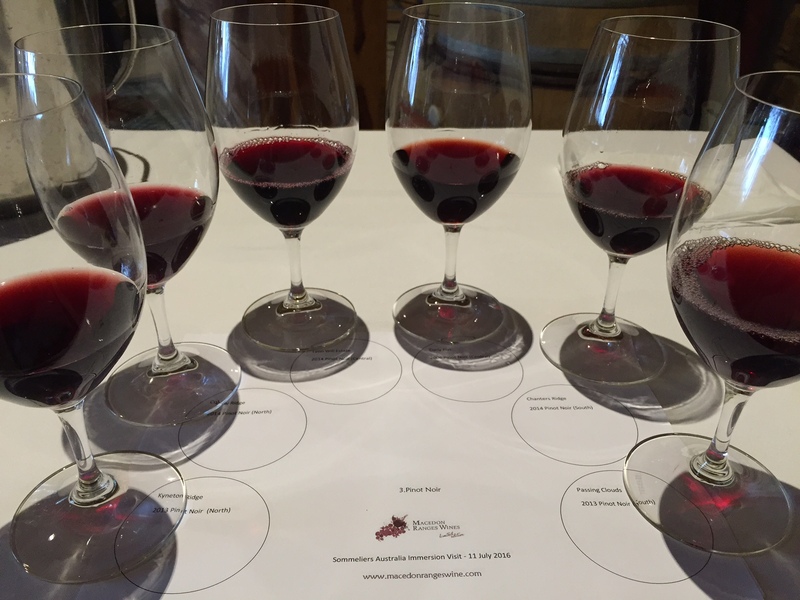 On a recent immersion trip with Sommeliers Australia and the Macedon Ranges Vignerons Association, hosted by biodynamic producer, Cowbaw Ridge Winery, I spent a day tasting through more than 40 wines from the region. What was clear from the outset was just how cold temperatures can get in this part of Victoria. At 610m above sea level and on a windy winter’s day with snow forecast for the following day, the region’s Continental climate was most definitely on show. As difficult as it is to make general statements about any region, particularly one that shares much warmer climes with its neighbours on the northern borders, the wines that were on tasting generally reflected the cool climate the vines are grown in. A wide variety of wines were sampled including sparkling, white, rosé and red. The reds in particular showed an attractive lean character to the structure with several showing herbal and medicinal notes. Much discussion was generated around why the region is not particularly well known, given the proximity to Melbourne. Producers such as Bindi Wines and Curly Flat have done much to increase the profile of Macedon Ranges, however just two producers belies the fact that there a number of other quality producers out there worth a closer look. 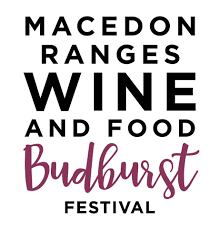 Throughout the year there are a number of events to tempt your tastebuds, such as the annual Budburst Festival held in November. With several accommodation options at any one of the towns in the region, such as Kyneton or Gisborne, the region also offers the perfect excuse for a weekend away. From the day’s tasting, the Lane’s End Chardonnay, the Passing Clouds Pinot Noir and the Cobaw Ridge Syrah were strong contenders with the group, myself included. Each wine revealed the skill with which they were crafted from vine to glass, a restrained structure and a very welcoming texture to the palate – creating in the mind’s eye numerous occasions on which to enjoy them in the future! One personal addition for me was the Lagrein from Cobaw Ridge. As the first commercial producers of this northern Italian variety from the Alto Adige region, Cobaw Ridge have blazed a trail with this grape. Dark in colour and high in acidity and tannins, this is a wine for food. I was captivated by the bitter cherry and black fruit characters together loads of spice and herbal notes – highly recommended if you come across it. Or better yet, jump in the car and head out to the Macedon Ranges – it’s too close to the city to miss out on the wealth of wines on offer!